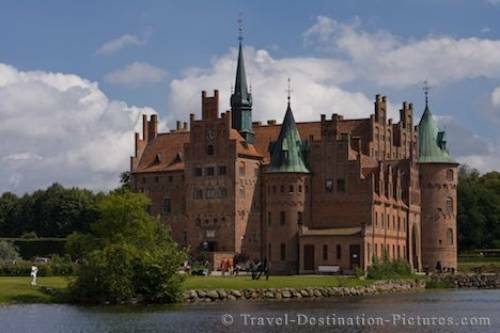 Egeskov slot (aka Egeskov Castle) on the Island of Funen located in the Baltic Sea represents one of the best preserved Renaissance castles in Europe. Situated on large park like grounds, the castle sits on a small island surrounded by a lake, in the south of Funen Island in Denmark. The castle got its name from the fact that a whole oak tree forest (Ege = Oak, Forest = skov) was felled to make room for the castle in the 16th century and were used to build the foundations of this historic building. Egeskov Castle, Syddanmark, Funen Island, Great Belt, Baltic Sea, Denmark, Europe. Photo of the Water Castle on the Island of Funen in the Baltic Sea, Denmark, Europe.